What is ANA-GH Used For? Main Goal: Mass and Weight Gain - ANA-GH by HGH.com replaces Anadral (Anadrol). It is an incredibly effective supplement for promoting weight and mass gains as well as gaining strength. ANA-GH is a favorite bulking compound used by elite power lifters, it is highly effective in promoting extensive gains in body mass by greatly improving protein synthesis. When used to jumpstart bulking cycles, ANA-GH causes a rapid yet equal buildup of strength and weight. Due to its high water retention properties, use ANA-GH to protect/lube joints while lifting heavy weights. Pack pounds in as little as 2 weeks! Use for a period of not less than four (4) weeks. Recommended use is a minimum of 3 months. Will solidify and create even greater post cycle gains when stacked with Clen-XDV. Take 8 Pills per day to be taken however you'd like (all at once or 4 in the AM and 4 in the PM). MAIN GOAL: Weight Gain - ANA-GH is a new formula that replaces Anadral (Anadrol). It is an incredibly effective supplement for promoting weight gain, and gaining strength. ANA-GH is a favorite bulking compound used by elite power lifters, it is highly effective in promoting extensive gains in body mass by greatly improving protein synthesis. 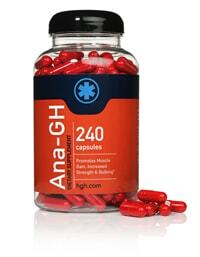 When used to “jumpstart” bulking cycles, ANA-GH causes a rapid yet equal buildup of strength and weight. Due to its high water retention properties, use ANA-GH to protect/lube joints while lifting heavy weights. Offers a high quality, "hard" look. Use for a period of not less than four (4) weeks. Will solidify and create even greater post cycle gains when stacked with Clen-XDV. Take 8 Pills per day to be taken however you'd like (all at once or 4 in the AM and 4 in the PM). ANA-GH exerts its anabolic effects through non-androgen receptor-mediated mechanisms as it has low affinity with androgen receptors. Because it exerts high anabolic activity but moderate androgenic activity, ANA-GH is capable of delivering extreme mass gains. So if you are after mass gains you must opt for ANA-GH. And if you do heavy lifting, ANA-GH is also a great choice due to its ability to retain water. Water retention acts as lubricant to joints and tendons, minimizing the occurrence of fractures and other injury. We took our existing bodybuilding and muscle growth supplement (Anadral), and revisited the complex structure of ingredients to remake and add a so many more bodybuilding and muscle growth factors and incredibly, we did it all in a pill! We're always on the leading edge of HGH Supplements - and ANA-GH is no different! ANA-GH revolutionized our industry. The ingredients include (and are not limited to) 1,500 mg of an amino acid called “L-Leucine”, which on its own merit has the capacity to stimulate muscle and protein synthesis and slow the degradation of muscle tissue by increasing the synthesis of muscle proteins. In fact, it’s the only amino acid that has that capacity. The new bodybulding pill also includes "L-Arginine", which is a common amino acid that helps in the healing of wounds, improves immune function, and the release of hormones. ANA-GH also has many other ingredients and a proprietary blend that will work to get you the best results possible. With ana-gh , is it advisable to take pre workout, bcca, whey protein? Hi Marty, The ANA-GH is one of the best products we have for overall weight and muscle gain. It works especially well for people with a fast metabolism who have trouble gaining weight. I think you'll be amazed with the weight you can gain in just the first month. i have a protein mix that has most of the ingredients listed in these pills and it actually has bigger dosages or whatever you wanna call it in it and i have not seen dramatic gains in muscle from the ingredients. so im not really convinced in buying this product if my shake has preety much all the same ingredients as these pills do and nothing has happend like this product says it will give. Amazing - exactly what I was looking for! This is quite possibly the best muscle gainer I've ever taken and I've been taking supplements for 15 years. This product is truly spectacular! Billy, you are 17 years old sir. EAT! Eat real food, and decent portions. Eat 7 - 9 times a day. Your body is a growing MACHINE all by itself... FEED IT! 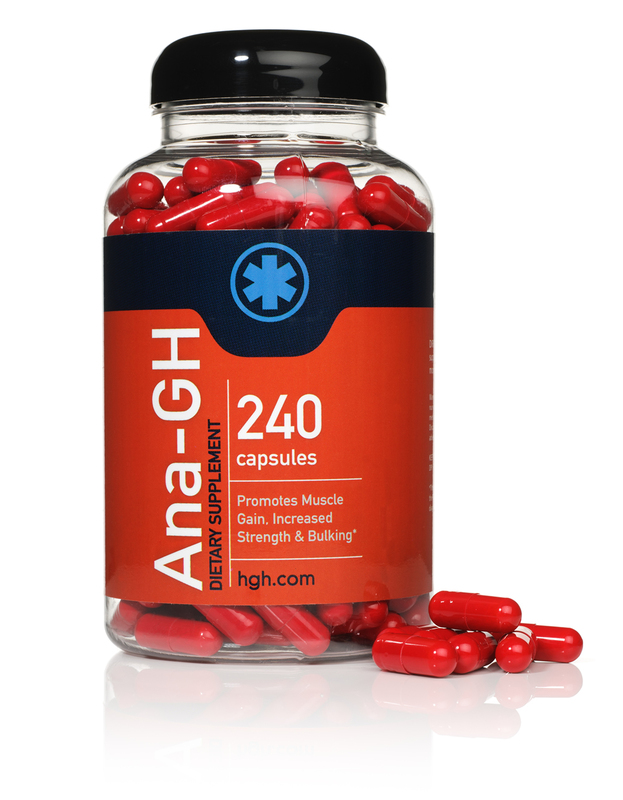 Btw I love the ana-gh and look forward to buying it again, it has to be one of the supplements I've ever purchased. I can't weight to stack it with the new one I just purchased yesterday. I'll keep you posted on the great results. Hello Jboy ANA-GH has no known side effects. So you should not experience anger or increased aggression. Hello Marty, The ANA-GH is an excellent product for promoting weight gain even in the hardest of gainers. You can pack on the muscle in as little as two weeks. I was lucky enough to get to use this product before it was released. It truly rocks! Thank you thank you! I saw results in about 3 weeks and I can honestly saw that I've already gained about 8 pounds and it's in muscle. In just 3 weeks, I saw incredible mass gains. I'm going to use this product for at least 3-4 months and no doubt it will get me in the shape I need. I have been working out 3-4 times per week on it in my normal regime. I have a really tough time gaining weight because of my high metabolism. I am 120lbs and about 5'11...I really need professional advice on what the best weight gainer/muscle gain product for me is. Take eight capsules daily. May be taken 4 in the AM and 4 in the PM, or all at once once time per day.